Seaham Harbour Time Line - The Vane Tempest Sculpture. This is a controversial piece of art which some say could equally represent a sailing ship. 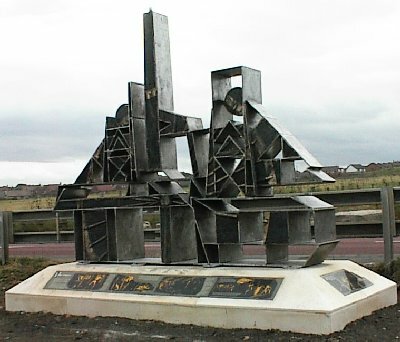 The interpretive panels around the base of the sculpture discuss the way in which the work of the Vane Tempest miners changed with developments in the coal industry. At present the structure is located opposite the old Vane Tempest Main Gates though there may be plans to relocate it at a later date. An example of the base panels is shown below. If you wish to express a view about any or all of the "improvements" please use the Seaham Harbour Online Guestbook.